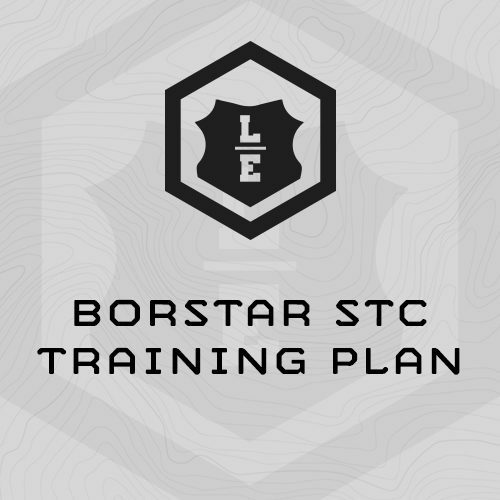 This demanding, 9-week plan is designed specifically to train athletes for the fitness demands of BORSTAR STC. It contains focused emphasis on improving BORSTAR Physical Fitness Test (PFT) scores, Swim Assessment scores, water confidence, and run and ruck performance. You’ll train 5 days per week, with two-a-days on Mondays and Wednesdays, for a total of 54 sessions, including multiple 2-a-days. Begin this training plan the 9 weeks directly before selection date. To successfully complete this program you’ll need to make training for selection a priority during your work day. This plan requires minimal equipment outside of what you’ll use at STC. A full list follows. - GPS Watch (we like the Garmin ForeRunner 10) for tracking rucking distance and time. 5 Rounds, every 60 sec. 5 Rounds, every 90 sec. an IBA, 25# weight vest, or pack. 800m Run @ designated PFT No.